I've given my friend Nan Myers the title, Sweet Peach Scout whether she likes it or not. She owns the incredible shop, Firefly, in Thomasville, Georgia and is the creative hand behind some beautiful events and weddings. So when she went to AmericasMart last weekend, I wanted the scoop on her new favorite artisans. The first name to arise was Kathryn Allison of Rangemark Textiles in Chattanooga, Tennessee. 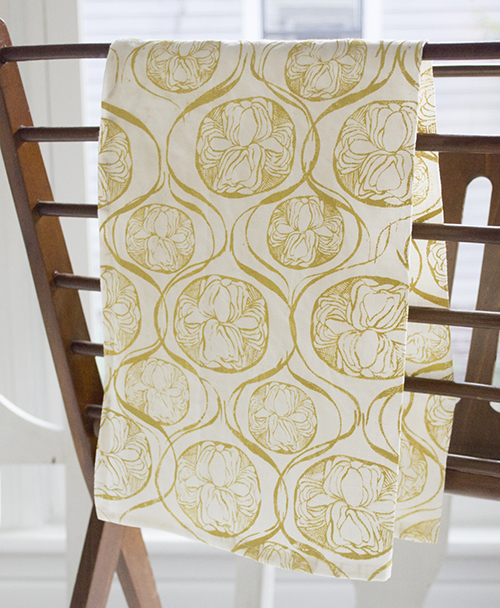 Using a screen printer, Kathryn hand prints the loveliest textiles for the home, all on 100% organic linen. Kathryn has always had a love of drawing and is enamored by the screen printing process. As she shared, "Even though the process is meticulous and time consuming, the magic comes to life when I lift the screen off the fabric and see my design transferred onto it." I believe one can never have enough cloth napkins. Kathryn offers five pretty patterns in her shop- Peonies, Arrows, Tear Drop, Feather and Frond. When I was at West Elm Atlanta last weekend for my Sweet Peach Picks event, I stumbled upon a new artist in the West Elm Local section. 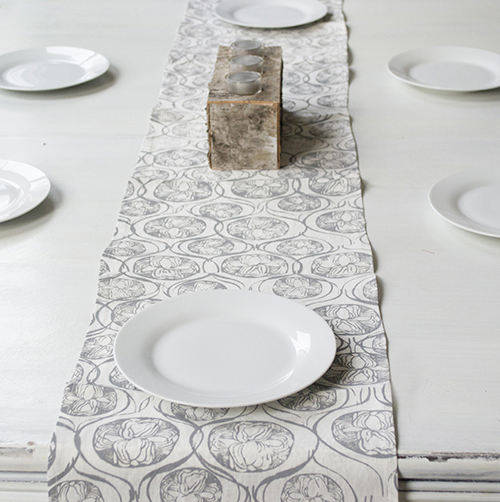 Her name is Sara Lee Parker from Athens, Georgia, and she handcrafts the prettiest textiles. Sara works side by side with her husband, Simon to screen print all of her designs by hand. Sara, "We have an 18 foot table and literally stand on opposite sides of the table to pass the squeegee back and forth." The best part is Sara uses water based inks and a sustainable, hemp certified organic cotton blend as a base fabric. Sarah, "It may cost more, but it's like buying groceries- once you learn what goes into factory-farmed, you can't stomach the cheap stuff." 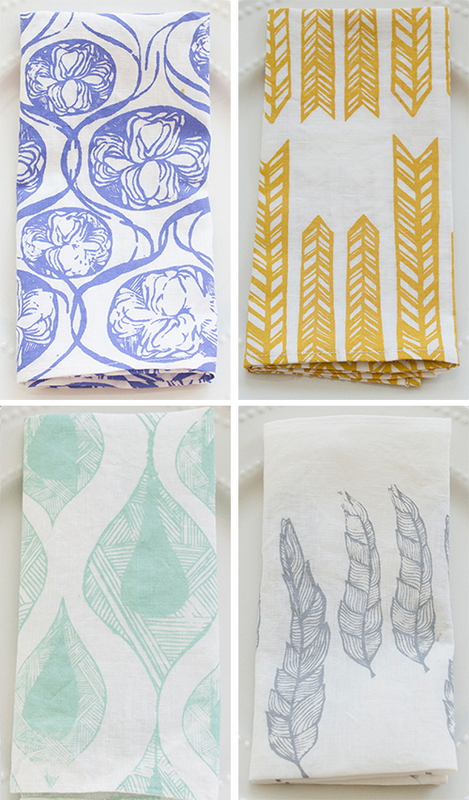 I'm a firm believer that you can't have too many tea towels- especially ones as lovely as these. Sara sells all her textiles at various southern shops, (including West Elm Atlanta) and online, here. My friend Shanna in Los Angeles recently sent me a link to Sugarboo Designs based in Roswell, Georgia. I immediately loved the shop and thought it would work well for Sweet Peach. Artist Rebecca Puig utilizes reclaimed wood, metal, burlap and a bevy of paints to create her pieces that inspire and generate lots of positive energy. I really like these two pieces of art...full of vibrancy and sweetness. When I asked Rebecca what she hopes her work conveys, she responded, "Love, happiness, gratitude for your family and home." Flower Bird and For My Darling Elephant can be found here. Come to think of it, a lot of Rebecca's work would work well for a Valentine's Day gift...many of her pieces speak of love and companionship. You'll find the written word in many of her pieces. She explains, "I am a sucker for words and have been collecting them since I was little. I am not sure where that comes from but it makes me happy to add them to my work." 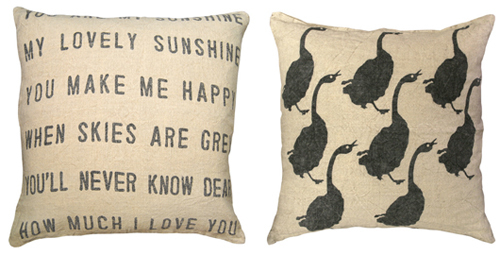 I like the rustic simplicity of her pillow collection. Rebecca has over three dozen smile inducing designs and she promises to have even more in the near future. 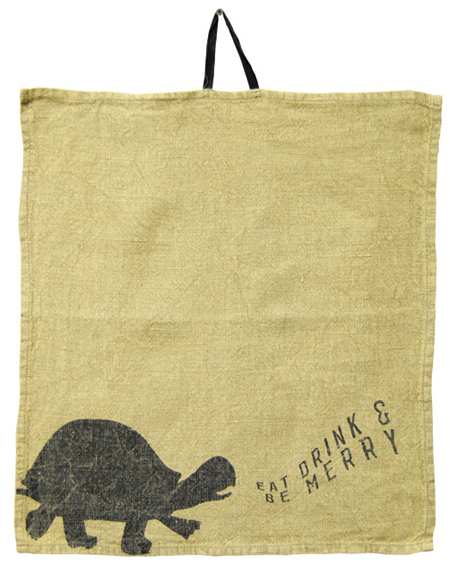 They're made from either stone wash linen, canvas or burlap. 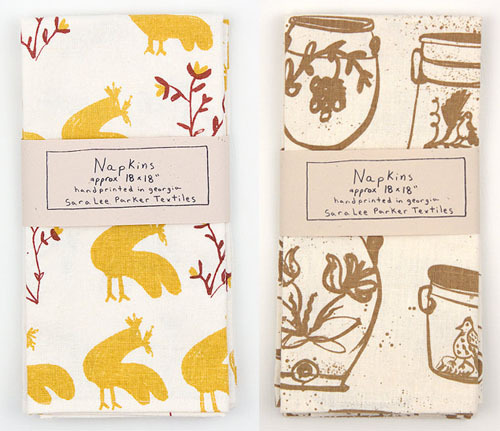 Just when you think you've seen all her work, you find out she makes napkins too. I just love these graphically pleasing prints of different animals saying different things... Peruse her site to see even more creative endeavors by Rebecca, including notecards, metal signs, picture frames and driftwood pieces.